Scott Pruitt sure is busy these days. The climate change-denying head of the Environmental Protection Agency has been renting out a Washington condo on the cheap from an energy lobbyist; installing a $43,000 soundproof booth for his telephone calls; passing out improper pay raises to aides; jet-setting around the world on first-class flights; hitting up Disneyland and the Rose Bowl with his oversized $3 million, 20-person security detail; receiving police escorts to trendy D.C. restaurant Le Diplomate; and even having a fancy dinner in Rome with Vatican treasurer, climate denier and recently charged child sexual abuser George Pell. Indeed, while Pruitt seems to have adjusted well to the culture of gratuitous and unprecedented graft and corruption inside the Trump cabinet, the media’s focus on Pruitt’s dizzying array of personal scandals obscures his absolute contempt for his agency’s stated mission: environmental protection. Pruitt, along with President Trump, Interior Secretary Ryan Zinke and Energy Secretary Rick Perry, has quietly been dismantling a multitude of environmental regulations while pushing a number of fossil fuel-friendly policies that will certainly have disastrous long-term effects on the environment and public health. In 2017, Trump announced he would pull the U.S. out of the landmark Paris climate accords by 2020, removing the country from critical — though far from adequate — international commitments. The EPA announced a future rollback of fuel efficiency regulations for automakers set by the Obama administration in 2012, which will have negative effects on air pollution. California, along with 12 other states, has challenged the EPA in court. The Trump administration approved the Keystone XL pipeline and the Dakota Access pipeline, in defiance of Native American and climate activists who have protested the pipeline construction for several years at Standing Rock, North Dakota. The Trump administration lifted the Obama-era ban on offshore oil drilling on the Atlantic and Pacific coasts, excepting only the state of Florida, the home of Trump’s Mar-a-Lago estate and three of his golf courses. Such drilling creates the potential for ecological disaster. The EPA lowered emissions-reporting requirements for factories and industrial plants, increasing chances of widespread exposure to toxic air pollution. The Trump administration and the Department of the Interior announced reductions to a number of national monuments to facilitate land privatization efforts in the name of drilling for oil and natural gas. Through the Republican tax bill, the Trump administration and Sen. Lisa Murkowski, R-Alaska, lifted the decades-long ban on oil exploration and drilling in the Alaskan Northern Wildlife Refuge, threatening local fauna and the lifestyle of local indigenous people. The Interior Department lifted a moratorium on federal leases for coal mining, perhaps the dirtiest of all energy sources. Pruitt blocked EPA grant recipients from serving on the agency’s science advisory boards, making it easier for fossil fuel lobbyists to steer EPA policy. This is only a tiny slice of what the Trump administration has been able to do so far, and most of the administration’s actions no doubt come as a result of the cozy relationship between the fossil fuel industry and the Trump cabinet. Yet if you rely on cable news or reading the front page of any mainstream newspaper, you might be forgiven for thinking that Pruitt’s personal indulgences were more important than his policies’ impact on the planet. In the past six months, CNN ran 96 pieces on Pruitt, but only 17 of them mentioned climate change, for example, at all. Of the 129 segments MSNBC ran on Pruitt in the past six months, only 30 of them mentioned climate change. 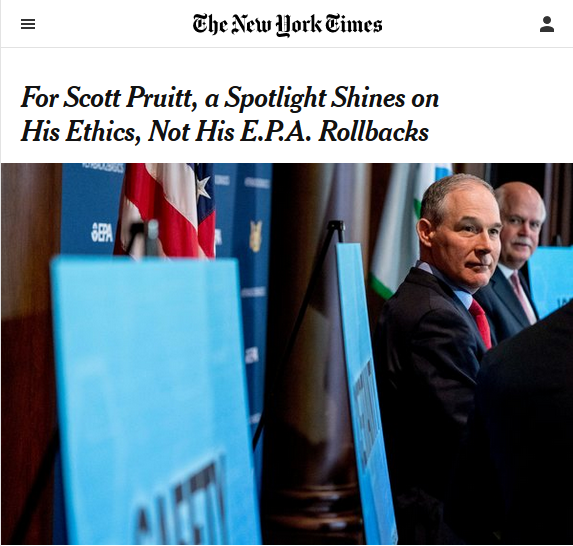 The New York Times devoted 49 articles on Scott Pruitt’s scandals in the past six months, but only 12 of those articles made a point of mentioning the specific effects of Pruitt’s EPA on climate change and the environment. Of those articles, only four explicitly noted the negative impact of Pruitt’s climate change agenda or dove into detail about its effects. Even when corporate media have stepped back and questioned the emphasis on Pruitt’s individual misbehavior, the analysis still manages to focus on what this means for Pruitt personally, rather than for human health and ecological well-being. The New York Times’ Coral Davenport wrote that Pruitt’s ethical transgressions obscured his environmental policy agenda — but framed this as a personal and political misfortune for Pruitt, not a threat to the environment. “A plan to weaken President Barack Obama’s stringent rules on planet-warming tailpipe emissions,” she reported, “should have been Scott Pruitt’s finest moment,” leaving him “basking in glory” — almost as if we should be rooting for Pruitt to successfully increase global temperatures. Stuart Shapiro in USA Today took a contrary line, complaining that “EPA Scandals Overshadow Scott Pruitt Failure to Undo Obama Environmental Regulations.” Shapiro, a professor of public policy at Rutgers, argued that Pruitt’s “deregulatory efforts to date have failed, and his plans for future repeals of regulations are likely to meet the same fate.” His point that “repealing a regulation is hard” is worth bearing in mind, but the focus is on whether Pruitt’s “accomplishments” are genuine and whether he deserves the “praise” he has gotten from Trump — not on how the success or failure of Pruitt’s efforts will impact the environment. Major news outlets need to pay attention to political scandals, whether Pruitt’s blatant corruption or Trump’s wild outburst of the day, but their singular focus on such stories obscures the devastation that environmental degradation will impose in the coming years, and the need for climate action as early as yesterday. It is no exaggeration to say that climate change could be the most challenging crisis in the history of humanity. Viewers and readers need to be inundated with information on how the Trump administration is setting climate action back, and the current and future negative effects of climate change, including sea level rise, temperature rise, destruction of plant and animal life, public health concerns like famines and diseases, increased instances of drought, wildfire, storms and flooding and effects on war, migration and refugee crises, among many, many others. While many of the varied scandals plaguing poor Scott Pruitt are intertwined with his comfy relationship with fossil-fuel special interests, that should only make it easier for media outlets to connect the profit-seeking motives of extractive industries with the complicity of the federal government in willful ignorance on climate change. Yet it might be near the end of the line for Pruitt; White House aides have decried his scandals as embarrassing and called for his firing. Pruitt’s successor will no doubt likewise be an ally of the fossil fuel industry, and might not be as nakedly corrupt. Bringing more sunlight onto climate issues now is necessary for setting a precedent for environmentally focused coverage in the future. "Frontline" producer James Jacoby joined SalonTV to discuss his new documentary "War on the EPA."